› Author Affiliations Funding TROPICAL-ACS is an independent, investigator-initiated trial, with an academic sponsor (Klinikum der Universität München, Munich, Germany). The trial was financially supported by a research grant from Roche Diagnostics (Rotkreuz, Switzerland). Prasugrel purchase, drug delivery and related logistics were kindly supported by Eli Lilly and Company and Daiichi Sankyo Company. The funders of this study had no role in study design, collection of data and data analysis or writing of the manuscript. Long-term evidence supports a clustering of cardiovascular events in the early morning and smaller mechanistic studies in aspirin-treated patients have shown increased platelet reactivity at the end of the dosing interval. Comparative pharmacodynamic analyses for different adenosine diphosphate (ADP) receptor inhibitors in percutaneous coronary intervention-treated acute coronary syndrome (ACS) patients are lacking and this pre-specified analysis from the randomized Testing Responsiveness To Platelet Inhibition On Chronic Antiplatelet Treatment For Acute Coronary Syndromes (TROPICAL-ACS) trial aimed for the first time at investigating diurnal variability of on-treatment platelet reactivity in clopidogrel versus prasugrel treated patients. 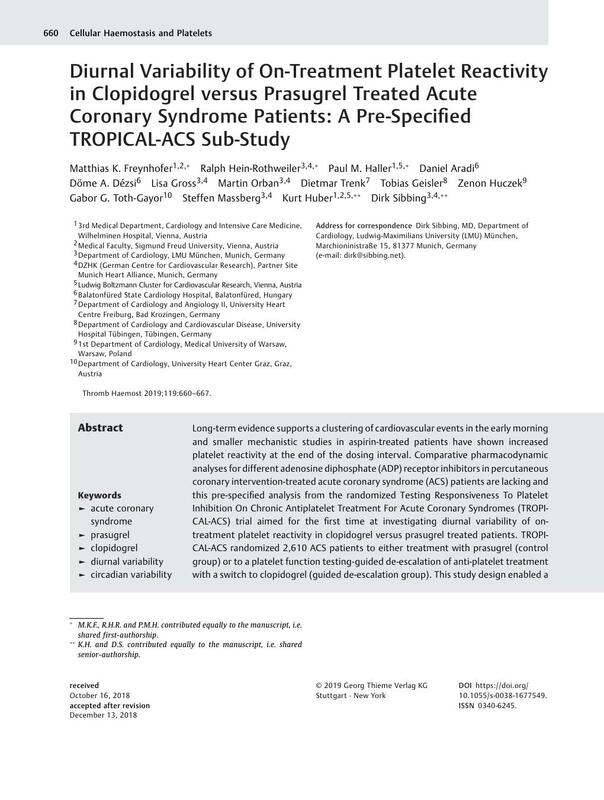 TROPICAL-ACS randomized 2,610 ACS patients to either treatment with prasugrel (control group) or to a platelet function testing-guided de-escalation of anti-platelet treatment with a switch to clopidogrel (guided de-escalation group). This study design enabled a diurnal comparison of on-prasugrel versus on-clopidogrel treatment platelet reactivity under steady-state conditions. For 2,526 patients (97%), both the exact time of blood sampling and the ADP-induced platelet aggregation value (in units, Multiplate analyser) were available. Platelet reactivity in patients on clopidogrel (n = 1,265) was higher and subject to significant diurnal variability (p = 0.019) with a peaking of platelet reactivity in the early morning (5–10 a.m.). In prasugrel-treated patients (n = 1,261), there was no sign for diurnal variability (p = 0.174) or a peaking of platelet reactivity in the morning. The potent ADP receptor inhibitor prasugrel is not subject to diurnal variability while we observed a significant diurnal variability of on-clopidogrel platelet reactivity. The clinical impact of this observation may differ for patients with and without an adequate response to clopidogrel treatment and the issue of diurnal variability of platelet reactivity in ACS patients warrants further investigation. This study is registered with ClinicalTrials.gov, number NCT01959451, and EudraCT, 2013–001636–22. * M.K.F., R.H.R. and P.M.H. contributed equally to the manuscript, i.e. shared first-authorship. ** K.H. and D.S. contributed equally to the manuscript, i.e. shared senior-authorship.